CEO Sean McCarthy made himself available for questions this afternoon to a group of people who had traveled to London to see the demo, but the content of this talk is not yet available. Guardian Blogs: Another case of too good to be true? Engadget: Holy snakeoil Batman, The Steorn Orbo exhibition has been canceled. What does this debacle mean for the future of Steorn? The way I see it, either 1) Steorn has actually discovered a means of producing free energy, or 2) they’re frauds, or 3) they’re too incompetent to realize that they have nothing. Over the past year they’ve taken every step I’d expect from a company that is confident that they have something revolutionary and real. Finally they put it all on the line by orchestrating a media event to introduce their technology to the public. And then… they fall flat on their face. They put a lot into this demo; it was polished, set in a well designed space peppered with brazen quotes about the power of scientific creativity to overcome rigid dogmatism, and centered around a simple transparent box that could be viewed from any angle in that London room or in the online world. I believe that they expected it to work. But with delay after delay, it refused to. Why? The reasons we’ve been given so far don’t sound very solid. First they broke some bearings, but were quickly able to replace them. Then they found that the plexiglass construction of the device had been permanently warped, and they placed the blame on heat generated by the lighting. This raises the question of their competence. Can museum lighting several feet distant permanently warp plexiglass? Let’s charitably assume that it can. Why had they not previously tested the device under the conditions of the demonstration? Why didn’t they have a backup device, or at least backup parts? In the two days they spent fiddling to fix it, why couldn’t they have flown in another device from their lab in nearby Ireland? This week’s events demonstrate that Steorn doesn’t have the competence to stage and test a reliable and successful display of their device. But where does this incompetence end? Does it run so deep that they’ve succeeded in deluding themselves for years about the reality of their discovery? Proponents of the “fraud” theory can find support in this failure as well. Some think that Steorn was prepared to display a device that faked free energy, and they failed to even get that decoy running smoothly. Others posit that this week’s failure was planned from the beginning, so they can claim that they honestly intended to demonstrate, but were thwarted by Murphy’s Law. I doubt the former approach because, even if they succeeded in demonstrating a fake device, where would that bring them in the long run? It would only raise expectations and media attention, while they would still have nothing genuine to deliver. I also doubt the “planned failure” hypothesis because this was an expensive and unnecessary ordeal, their reaction appears to have been one of genuine panic, and they’ve lost far more credibility than they’ve gained. For these reasons, I’d place my bets right now on incompetence rather than fraud. Whether they’re lacking merely in the ability to stage and test an impressive demonstration, or lacking the more fundamental ability to recognize that they do not have what they believe they have, still remains to be seen. ← Steorn demo delayed – again. Contrary to the previous comment, the chance that the Kinetica demo failure was the result of incompetence is negligible. Consider the situation carefully. 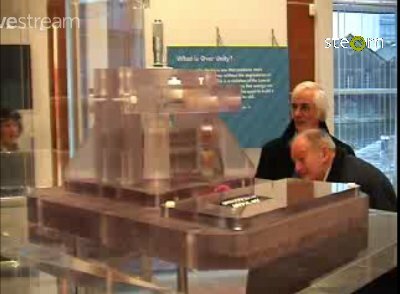 Although the jury is still out trying to determine if there EVEN IS a “Steorn Effect”, suddenly Steorn’s CEO has a magnetic device in his hands that allegedly will rotate continuously without external energy. If the wheel continues to turn, even if it eventually fails because of magnet degradation, it would constitute one of the most significant scientific developments in history. It is my opinion that this device was most likely intended as a rigged demonstration and that the CEO got cold feet or the rigging failed. If you watch the CEO’s video explanation after the fact, it shows the classical signs of lying. The demo shown at Kinetica is a simple mechanical device made of plexiglas and magnets and could be replicated over and over in a short time in a good machine shop. As is the downfall of many con artists, Steorn’s CEO over played his hand at Kinetica. The reason is unclear, although it may be that the original effect that Steorn thought they observed, following the expenditure of hundreds of thousands of shareholders’ dollars in advertising and research, is now proving unfounded and the Kinetica demo was a desperate attempt to keep the house of cards from collapsing. Whatever the answer, the end is looming for Steorn and for its CEO. It will make a great story of deception and intrigue on ABC’s 20/20. You can buy plexiglass everywhere, and they will even cut it for you to the dimensions you want for free or a few bucks. This excuse is really bad.